The title caught my eye. It reminded me of the song 'What does the fox say' and in my head I was already thinking of the ridiculous things this Giraffe would say. 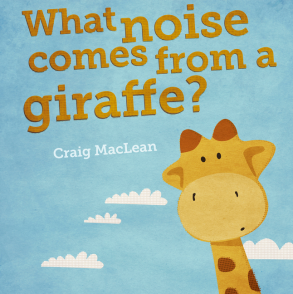 We go through the usual animals that make sounds that kids know and love. Meow. Moo. The pictures are great. Simple. Bold. Vivid. I'm sure your wee one will enjoy mooing and neighing along while you read it. The ending will be a surprise. You might even do what the giraffe does.